It was the summer of 1945 when my father informed us that we were moving to a small town called Newhall. We drove directly from a motel in Sherman Oaks. I thought the trip would never end. I was nine years old. We drove north on old Highway 99, turned west onto Pico Canyon Road, passed the Larinan Ranch and continued over a steep, winding grade, finally arriving in a valley which would be our home for the next seven years. My father's employer, the Barnsdall Oil Company — later Sun Oil and Sunray Oil Co. — built us a ranch style house on the Newhall-Potrero lease in the Pico Canyon area. The contractor, George Whitmore, had been born at the old Newhall hospital on San Fernando Road, and his family still lives in the area. Our house was surrounded by the gorgeous oaks and rolling hills of The Newhall Land and Farming Company's vast Rancho San Francisco. My memories of the time are those of a young, impressionable child. I was born Judy Borden in Taft, California in June of 1936, and my father was transferred to the Ellwood lease three months later. Ellwood was a small community twelve miles north of Santa Barbara and five miles north of Goleta. It wasn't really a town; it didn't even have a grocery store. It consisted of oil fields, outlying ranches, four lease homes, an itsy-bitsy restaurant called the Wheeler Cafe, and a school. Our only neighbor after the Japanese shelling of February 23, 1942 — the only time the Japanese struck the mainland United States — was the Lou Shields family, who would also move to Newhall. Ellwood School had eight classrooms, but only two were used after the shelling. Each grade had a row. Everyone took the same multi-level test. Our home was on the coast, so I lived in constant blackout and relative seclusion. I had at least one neighbor in Ellwood, though, and a best friend a mile away. Now, in Pico Canyon, there were no neighbors! It was about one mile to the Standard Oil lease home on the other part of the "Y" intersection in Pico Canyon, over on the Mentryville side, if you wished to climb the mountain. Otherwise, it was three miles away. The Larinan Ranch was two miles down Pico Road. I had to travel a mile just to catch the school bus, as it could not negotiate the hill. Little did I know at the time that I would grow to love the area and the solitude. We moved to Pico in July, 1945. What a way to celebrate the end of a war that had significantly affected most of this nine-year-old's life! It was a hot and dry desert environment. We didn't have the trees, swimming pools, landscaped homes or Castaic Lake that contribute to today's climate. Summer temperatures surpassed 100 degrees, but without the humidity or smog. We soon adjusted to our surroundings. My sister, Barbara, and I explored miles of pristine countryside. We even discovered evidence of native Indians in some of the caves. Our only companions were Newhall Land's cows and our faithful Saint Bernard, Switzy. My father was a hunter and, with lease hunting privileges, provided a large quantity of our venison. Local entertainment for youngsters in the 1940s included the radio, Classic Comics, games and song books — comic books that included the lyrics to popular tunes. Numerous war songs originated in England, but we learned them all: White Cliffs of Dover, I'll Be Home for Christmas, Till the Lights Come on Again All Over the World, White Christmas and more. Don't Fence Me In and San Fernando Valley were local favorites. Comics included classic stories like Les Miserables, Jane Eyre and A Tale of Two Cities. These comics led me to read the unabridged versions of the books by the time I was ten. Radio was the entertainment center for most families. When the dial was tuned to Walter Winchell, the children were not to interrupt. The going soap was One Man's Family, a melodrama of a family's trials and tribulations during the war years. Some of my favorites were Let's Pretend, Grand Central Station, The Green Hornet, Inner Sanctum (this always scared me to death), Jack Benny, Fibber McGee and Molly, Fred Allen and Charlie McCarthy. The shows required a creative imagination not often demanded of today's children. Fairly little was unusual or exotic about my early days in Newhall. If you take our valley today and eliminate 150,000 people, freeways, television, Cinerama screens, stereophonic sound, air conditioning, Valencia, four high schools, four junior high schools, innumerable elementary schools, the Industrial Center, Magic Mountain, most paved roads, housing developments, traffic congestion and divide the stress level by 100, you will find the Newhall of yesterday. Newhall Elementary School overwhelmed me at first. Just think: The 5th grade alone had 35 students! I lived six miles from town. To me that meant walking a mile and riding the school bus on a long loop the rest of the way. How was I to make friends? My parents were helpful and drove me to various activities, like the Girl Scouts. The rest of the time I rode my bike or walked, and eventually I did manage to make some lasting friends as I slowly became a part of the town. Our valley had two elementary schools in the 1940s, Newhall and Saugus. The 9th grade class was housed on the Newhall Elementary School campus. These students are the famous '49ers — the first class enrolled in the William S. Hart High School District. Before 1949, 10th through 12th graders went over the hill to San Fernando High. Saugus had perhaps five businesses including the Saugus Cafe (today the oldest continuously-operating restaurant in Los Angeles County); a small grocery store; and the train station. There were a few old homes, but most people lived in remote areas. Newhall was far more populated. Some of Newhall's memorable establishments were Ye Olde Courthouse (I took dance lessons on the upper floor); the old Safeway, which is Tresierras today; the M & N Market, famous for its corn-fed beef; the train station; Bank of America; Powell's service station; the "dime" store on the southeast corner of San Fernando Road and Market St.; Frew's blacksmithing and welding shop; and the French Village, owned by the MacDougalls. The Williams' drug store, Rexall Drug on the southwest corner of San Fernando Road and Market, sported an old-fashioned soda fountain where everyone met for milkshakes. When the Williamses finally closed their doors in 1993, it was the end of an era. Two churches stand vivid in my memory: the First Presbyterian Church on Newhall Avenue, destroyed in the 1971 earthquake, and the Catholic church on Walnut Street. I was a member of the Episcopalian Church, whose nearest parish was in Tujunga, so I often attended services in Newhall's two lovely old churches. Later a general store and the "Boogie Beat" served the students of the new Hart High School. Residential areas were bordered on the north by 16th St., on the south by Pine St., on the east by Race St., and on the west by Arcadia St. A few homes dotted Happy Valley and the Atwood area, where most streets were still unpaved. Probably the newest residences were the Bermite houses, built by Bermite Powder Co. during World War II for its many wartime employees. There were some lovely old homes in downtown Newhall. They were far from mansions, but they were stylish. Arcadia Street was "the" place to live. Many of these homes still stand. Outlying territories were sparsely populated. What we now consider "nearby" was remote and isolated in those days. San Francisquito Canyon contained a few scattered ranches and a small community near the site of the 1928 St. Francis Dam disaster, where residents were employed by the power plant. None of the homes off of Seco Canyon were there until Bill Bonelli started construction on our valley's first "tract" housing in 1947. Bouquet Canyon featured a few scattered ranches as well. The recreation areas and vacation homes far up the canyon remain basically unchanged. The best shish-kebab in Southern California could be had at Logian's Big Oaks Lodge. Placerita Canyon was another sparsely populated area. We often hiked to the Oak of the Golden Dream and the Jauregui Ranch. In those days the famous Oak was not well labeled, and arguments would ensue as to which tree was the one where Francisco Lopez napped in 1842 before awakening to make the first documented discovery of gold in California. Sierra Highway was the route between Los Angeles and the Antelope Valley, the latter consisting of ranches and hotels used as desert retreats. The Halfway House restaurant coined its name as the mid-point along that route. Other landmarks were Dillenbeck's Market and the Dyer Honey House. We used to climb around Vasquez Rocks, hoping to spot Indian artifacts or the legendary Vasquez treasure. With no freeway or park at the time, it was a real wilderness experience. It would have been simple for an outlaw like Vasquez to hole up there. One unique adventure was to visit the old Solemint Store, near the southeast corner of Soledad Canyon Road and Sierra Highway. This was the boondocks, and you could easily picture the store sitting in the middle of an old 19th-century Western town. You name it, you could find it at this store. Since Disneyland and Magic Mountain did not yet exist and the old ghost towns had not yet been restored, there were few places where a youngster could recapture the spirit of the previous century. Perhaps this is why such establishments abide in one's memory. The northeast portion of Soledad Canyon has scarcely changed. Soledad Canyon was the route discovered by William Manly in 1849, when he sought help for the unfortunate members of the Bennett-Arcane party who were stranded in Death Valley. Manly eventually received help from the workers at the Rancho San Francisco. Bonelli Stadium (Saugus Speedway) was the home of the annual rodeo. Originally built by Hoot Gibson, this ranch was purchased by the Bonelli family in the late '30s. The rodeos were famous and drew people from miles away. William S. Hart often attended, but he was an infirm, old man by this time. Hart died soon after we moved into Pico. He donated his mansion and land for the present park and for the valley's first high school. Another popular event was the annual Fourth of July celebration. After the parade, we would collect in movietown's "Slippery Gulch" — Melody Ranch. Many sets were merely false fronts, but there were several complete buildings, too. Festivities lasted well into the night. Men without beards were promptly tossed into the horse trough. Mock gambling took place in the realistic establishments, and the Bird Cage Theater held hourly revues featuring all-local volunteer talent. In August of 1962, a ruthless fire consumed Melody Ranch. The burning buildings were captured for posterity in a photo taken by Fred Trueblood, then owner-editor of The Newhall Signal. Two events at Newhall Elementary School stay with me. Every year, showman Montie Montana and his family performed roping and riding tricks for the student body. I often fantasized that one day, I would own a horse of my own. We also celebrated May Day, where children would decorate baskets, fill them with flowers and leave them on doorsteps for family and friends. The Maypole dance featured bright crepe paper streamers attached to the top of a pole. Students danced around the pole, weaving the strips over and under, thus creating a woven wrap. May Day became a Russian celebration commemorating the 1917 Bolshevik Revolution, and the festivities were subsequently banned by the United States government. I had some unique teachers and administrators in elementary school. Mr. Dalbey, the principal, and his family were good friends. He was a fair man but a regular dictator. His disciplinary methods would never fly in today's schools. Mr. Dalbey would stand outside the classroom, unseen by the students, and look for those not paying attention. Luckless students were removed by the neck and taken to the office. I never knew what took place in that office, but trust me, I intended never to find out! All students ate in the cafeteria and were not permitted to save a place while standing in line. Violation of this reasonable rule prompted swift and immediate corporal punishment. Needless to say, Newhall Elementary School children were very well-behaved. Miss Curtain was our 6th grade teacher. She claimed that she died and returned after major surgery. According to Miss Curtain, heaven is a beautiful, peaceful existence. Despite her eccentricity, she was an excellent teacher who centered her life around her career and religion. Always dressed in ultraconservative apparel, Miss Curtain came into the classroom and immediately commenced the day's lesson. There was little humor in her style, but she was an outstanding reader and enchanted us with an hour each day from many literary classics. Our 7th grade teacher was Mr. Moore. One of the most memorable things about Mr. Moore was his philosophy toward communism. This must have been before public school teachers had to take a loyalty oath. Several times, Mr. Moore asked his class to define communism, only to end up yelling and screaming that we had been brainwashed by our parents and our anti-communist government. Although I never saw it, he often referred to a "card" that he carried in his wallet. Once he invited five or six of us to his home. We had no idea what to expect until he handed us the records of all our fellow students and asked us to discuss their performance and determine their grades. I told my parents about the venture. They were horrified. It was OK for teachers to swat children in the classroom. Mr. Moore's favorites seemed to be the little girls. He would tell them to stand in front of the class, bend to touch the floor and receive their swat. Remember, girls were required to wear dresses in those days. Mr. Moore did not return the next year. Because I spent most of my adult life teaching high school mathematics, I am intrigued by some of the things our erstwhile teachers were allowed to do. I must admit, though, that students were far more disciplined than they are today. In 1948 the 7th and 8th grades moved to Hart High. I was now a big 8th grader and was able to attend school functions and movies with my friends. Transportation from Pico Canyon to school was problematic, so I often spent nights with friends or at the home of A.B. Perkins. The Perkinses were marvelous people with an open-door policy for me, and as is commonly known, they were our local historians. I often regret that in my youth I didn't take advantage of their vast knowledge of the territory. I've often held that much educational opportunity is wasted on the young. Our family did a lot together. We often traveled to the San Fernando Valley, Hollywood or Los Angeles for entertainment and shopping. Entertainment in Newhall was limited to school activities, the great outdoors, and "B" movies. Many cowboy movies were filmed in our own Placerita Canyon and Melody Ranch. The "gang" would meet at the old American Theater (now the American Legion Hall) for a Saturday afternoon matinee starring Roy Rogers, Gene Autry, Jimmy Wakely or Bob Steele. There was a great deal of camaraderie during these movies, since we always knew the outcome. Yes, today's youth would find these films boring and corny, but even in those unsophisticated days, movies were meant to release tension and provide escape from daily realities. "I can show you the life on the Plains, in the cattle country, either as it was or as you think it was. It will be all the same to you. It is so different from the life you and all your ancestors have known that the truth about it will be strange as any fiction that I or my authors may invent. "Give me a fast horse, a mean villain, a beautiful woman, and plenty of open country to ride in, and I'll fill your eyes so full of dust and pistol smoke that you will forget yourself and the world you live in. Come ride with me to a Far Country." "We love our Bill (Hart) and can hardly wait until the shooting begins. As for myself, I never see such a performance but that I later go out of the theater and, when I get off into a quiet street alone, I become just such another. "Looking about to see that I am unobserved, I jerk two imaginary guns out of my hip pocket and draw a quick bead on some nearby tree. 'Dog,' I cry, 'unhand her.' All my early reading of American literature comes into my mind, and I try to do a thing that is always being spoken in the books. I try to make my eyes narrow to pin points. Bill Hart can do it in the pictures and why not I? "As I sat in the movie house it was evident that Bill Hart was being loved by all the men and women and children sitting about, and I also wanted to be loved — to be a little dreaded and feared, too, perhaps. 'Ah! There goes Sherwood Anderson! Treat him with respect. He is a bad man when he is aroused. But treat him kindly and he will be as gentle with you as any cooing dove.'" So much for Western melodrama. It is a bygone age but one which will linger in our memories forever. One should not assume, from the above, that we were deprived of other types of films during the '40s and '50s. The World War II and Postwar years were filled with movie greats too numerous to mention. The biggest stars have been immortalized by succeeding generations. It is the rare teen today who does not know the name of John Wayne, Humphrey Bogart, Doris Day, James Cagney, Frank Sinatra, Katherine Hepburn, Bing Crosby, Gene Kelly, Jimmy Stewart, Spencer Tracy or Clark Gable. The extravagant MGM musicals and drive-in theaters were just beginning to emerge. We usually had to travel to Sherman Oaks or Hollywood to enjoy the better films, and we did so about once a month. Our first television was certainly a novel addition to our entertainment. Imagine watching sports, movies and situation comedies on a 10-inch black and white screen in one's own living room! An incomplete list of popular programs would include The Lone Ranger, Sid Caesar and Imogene Coca, Hopalong Cassidy (William Boyd), The Milton Berle Show, The Jack Benny Show, I Love Lucy, The Honeymooners, Time For Beany, The Chrysler Theater, Hallmark Hall of Fame, The Roy Rogers and Dale Evans Show, Death Valley Days (starring Ronald Reagan), Gorgeous George, Stan Chambers, The Eve Arden Show, The Steve Allen Show, George Burns and Gracie Allen, This Is Your Life (Ralph Edwards), Candid Camera, The Jackie Gleason Show, Arthur Godfrey, Cliffie Stone, Groucho Marx, Ozzie and Harriet, Truth or Consequences (Burt Parks), Wagon Train (Ward Bond), Father Knows Best and The Red Skelton Show. The Newhall Park swimming pool materialized in 1949 or 1950. It was an extremely popular hangout in summer months. Prior to its construction, children swam in the old mud hole near Weldon Canyon or Havenstrite Reservoir. Trips to the beach were infrequent. Built in the early 1950s, the Hart High School gymnasium was the most modern gymnasium in our league. We were the envy of all. The 1994 earthquake demolished the structure; it was replaced with a magnificent new gym that opened just last month. Many are the memories of good times in the old gym. All dances, including proms, were held there. We became master innovators at decorating and used netting to cover the ceiling and stage props to hide the bleachers. The entre student body numbered only about 200. Sock hops followed every sporting event, and the vast majority of students attended these functions — even though our source of music was usually just the old phonograph! Boys' sports have changed little over the years, except for the extensive body building necessary to protect the physical well-being of today's semi-professional athlete. Girls' sports, meanwhile, have undergone a major metamorphosis. Some of the ridiculous rules that implied an intrinsic weakness in the female body have long since vanished. Imagine volleyball with two self sets or basketball with guards and forwards restricted to their own half of the court! Girls never ran the mile, and girls' cross country would have been considered outrageous. It has always amazed me, an aficionada of the pioneer era when strong women walked halfway across the continent, often producing a baby along the way, that well after my high school years, doctors considered the 800 meter race too strenuous for the delicate female body. Nonetheless, girls' athletics were very popular in the early '50s. A major high school goal was to earn a letter. Educational goals in the 1950s were slightly different from today's. Students were expected to earn good grades, master the basics and major in either college preparatory courses or business. Career goals were determined after one completed general education classes in college. There was no need to declare a major on one's entrance application. Today's student must worry about a career at age 16. Our principal at Hart High was George Harris, a father figure for all. We relied on Mr. Harris to solve our "life threatening" problems. He was the district superintendent when I hired into the district as a teacher in 1970, and he has the uncanny ability to remember all of his ex-students. 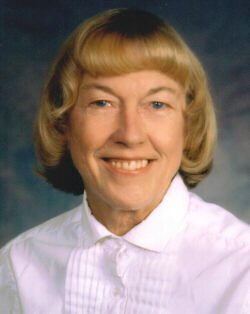 Mertle Bjornstad was the principal's secretary and another parent image. "Mert" was everyone's friend. After leaving Hart, she worked for many years at the Williams' drug store. I enjoyed later trips to the drug store, where I could talk over old times with Ralph, Susan and Mert. Newhall of the 1950s was an evolving community which retained a bit of the Old West spirit. This esprit was captured at Hart High. The original teachers might be compared to those inspired "ghosts" of the 19th Century who built California. How well I remember Mrs. Haskell, Mr. Sims (resident "character" and composer of the school alma mater), Mr. Dundon, Mrs. Lewis, Mr. LeFevre, Mrs. Snow, Mrs. Phillips and more. These are the people who built the traditions which survive in the system today. In 1952, my father received a promotion requiring a move from our Pico Canyon home. I had mixed emotions about moving into my grandparents' beachfront home in Laguna. Who wouldn't? I had just turned sixteen, rather enjoyed my quiet Newhall life, and wanted to graduate from Hart. No such luck. I thought I was never to live in Newhall again. But it's a small world. In September of 1957, my husband Jay, our young son Mark and I returned to the Santa Clarita Valley. Our daughter Terry was born in February, 1958, and our son Matthew followed in December, 1965. We rented a Bermite home on Spruce Street and then purchased a house on Wheeler Road. In late 1967, we were among the first owners in Old Orchard I. The subsequent growth of the area has been far too rapid to contemplate here. Suffice it to say that we raised our children, I earned my degrees, we participated in the civic and political scenes, we were active in the chartering of the St. Stephens Episcopalian Church, and I taught high school mathematics for 31 years. In 1982 we moved to Agua Dulce but have continued to associate ourselves primarily with the Santa Clarita Valley. I now recognize what a profound effect the first 16 years of my life had on me. I shall always want to be surrounded by land! Expansion in the Santa Clarita Valley has been well planned, giving us attractive housing with abundant paseos, accessible entertainment and shopping areas. Despite all these advantages, I still have fond memories of the way it used to be. No one wishes to live in the past, but I do believe that in today's ultra-technical society, it would be advantageous for our youth to comprehend and pursue some of those uncomplicated activities which so often afforded us some peace of mind while they live their lives in the fast lane. ©1997 SCVTV/OLD TOWN NEWHALL USA — ALL RIGHTS RESERVED.